A grandmother is preparing to run the Milton Keynes half-marathon in aid of Headway Aylesbury Vale. Former Sir Henry Floyd Grammar School pupil Sue Askham will be competing in the race on Sunday. Mrs Askham, 59, who lives in Duston, Northamptonshire, has two kids and nine grandkids. She decided to raise cash to help the charity in Fairford Leys, Aylesbury, where her sister-in-law Karen Styles is manager. Sue only took up running about a year ago to improve her fitness and ran her first long distance race, a 5k, in March. This was followed by a half marathon in October in Peterborough, which she completed in 2 hours 19 minutes. 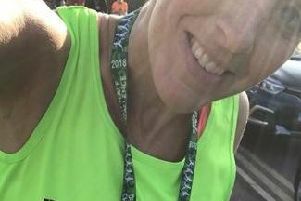 “I am 60 next year and I wanted to do a half marathon before then, but it’s now got out of hand because I will have done two this year and I haven’t even reached 60 yet!” she said. Sue, is aiming to complete the 13.1-mile Milton Keynes race in two-and-a-half hours because she believes the tendon injury will slow her down. It will be her tenth race this year. Before she took up running recently, her only previous similar effort came in 2013 when she entered a Race For Life event in Milton Keynes. But disaster struck shortly before that race when she fell over and broke a hip. But Sue’s determination still won through. “I did the race in a wheelchair four days after coming out of hospital,” she said. Headway currently provides its services two days a week, Mondays and Wednesdays, in modern, purpose-built premises behind the Co-op in Wedgewood Street, Fairford Leys. In the Aylesbury Vale alone, there are some 1,500 survivors of Acquired Brain Injury which can happen to anyone of any age and can be caused by injury or an illness.